Love this bold, yet unas­suming, Fed­eral Gold Leaf Mirror from Worlds Away that pro­vides a sophis­ti­cated touch for tran­si­tional decor. 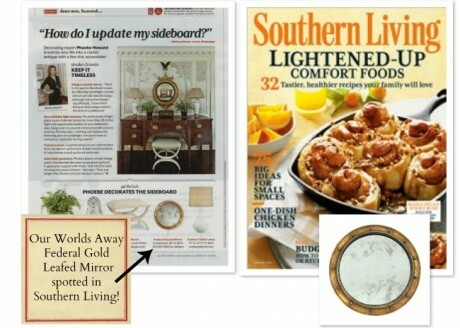 We were thrilled to see our Worlds Away Fed­eral Gold Leafed Mirror in this month’s Southern Living “Dear Mrs. Howard…” sec­tion. We are fans of both Phoebe’s monthly column and Southern Living.